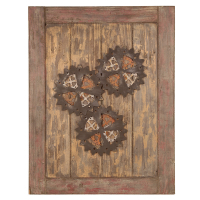 This unique wall décor features weathered brown wood finish with three interlocking metal cogs. Two hooks on back for easy hanging. Made in China. 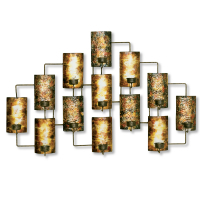 This large wall décor makes a dramatic statement in any home. 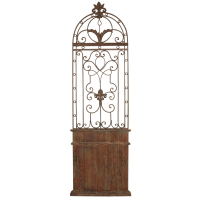 Rough hewn distressed wood bottom with oil rubbed bronze metal top . Hooks on back for easy hanging. Made in China. Nostalgic for the projection film days? Well this wall art brings that into your home. 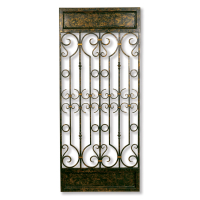 Made of metal featuring oil rubbed bronze finish with distressed silver and maroon highlights. Two hooks on back for easy hanging. Made in China. 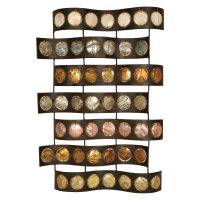 This two tone metal wall shelf is as beautiful as it is functional. Three sturdy metal shelves to display on. Made in China. 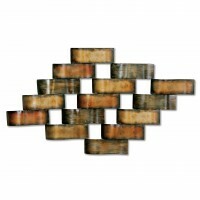 7 wavy lines of black metal surround colorful capiz shells. Hooks on back for easy hanging. Made in China. 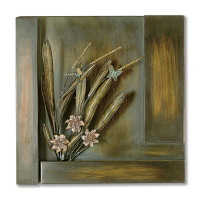 Metal wall art featuring weathered green background with oil rubbed bronze branches. 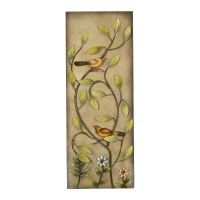 Green leaves and colorful flowers and birds round out this wall panel. Hooks on back for easy hanging. Made in China. 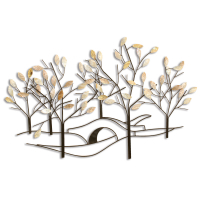 Oil rubbed bronze metal depicts a tree lined street with tan & cream capiz shell leaves on the tree. Hooks on back for easy hanging. Made in China. 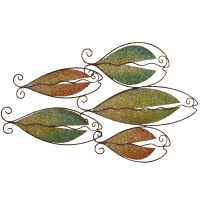 Oil rubbed bronze stems are adorned with metallic green leaves. Hooks on back for easy hanging. Made in China. 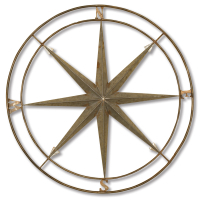 All directions lead to your home with this compass wall art. Gun metal silver and distressed copper finish. Hook on back for easy hanging. Made in China. 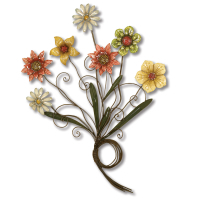 Metal floral wall décor with oil rubbed bronze finished stems green leaves and colorful light blues, yellow and red flowers. Stem knots at bottom for a dramatic flare. Hooks on back for easy hanging. Made in China. Scrolled iron in burnt copper finish. Hooks on back for easy hanging. Made in China. Nautical themed wall art. 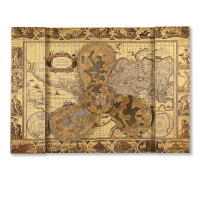 World map background in distressed green and browns features a ships rudder. Hooks on back for easy hanging. Made in China. Nautical themed wall art. 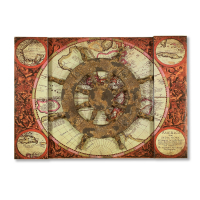 World map background in distressed green and browns features a ships wheel. Hooks on back for easy hanging. Made in China. 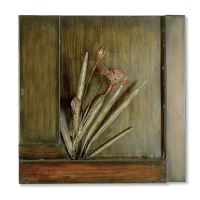 Wall art in oil rubbed bronze finish features bronze stems and green and burgundy pressed metal flowers. Hooks on back for easy hanging. Made in China. 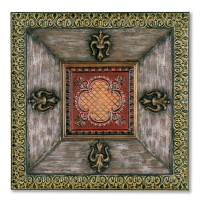 Cut out metal wall décor features rich red and green colors while still letting your wall color show through. 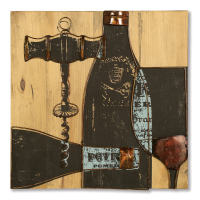 Features wine bottle, wine glass grapes and leaves. Hooks on back for easy hanging. Made in China. 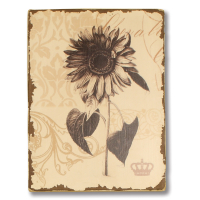 Distressed brown and cream flower wall art. Hooks on back for easy hanging. Made in China. Thirteen different hammered and stippled rectangles hold thirteen tea lights, (candles not included) that will add a warm glow to almost any room. 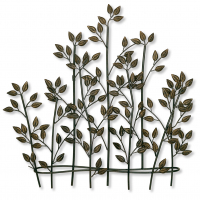 All pieces are linked together by sturdy metal wires to form a beautiful piece of wall art. Hooks on back for easy hanging. 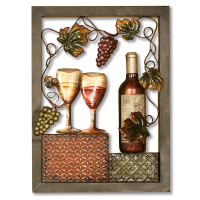 Beautiful rectangular metal wall art features a bottle of wine with two wine glasses. 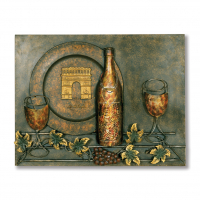 Arc de Triumph in the distance completes this vineyard-inspired piece. Finished in bronze with gold highlights. Hooks on back for easy hanging. Made in China. 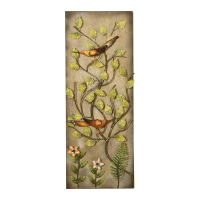 Warm greens, burnt oranges and gold highlight this “wavy wall art”. Hooks on back for easy hanging. Made in China. 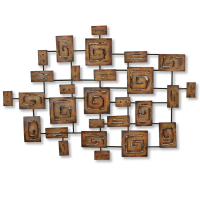 Geometric designs in warm golds and brown adorn this wall sculpture. Hooks on back for easy hanging. Made in China. 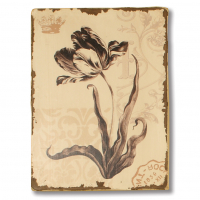 This unique wall decoration has hand painted flowers and finished with a distressed appeal. Hooks on back for easy hanging. 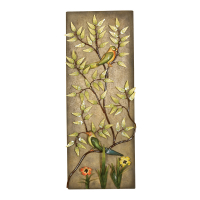 This piece of wall décor is both simple and elegant. The opalescent white capiz shells pose as leaves on the trees twisted limbs. 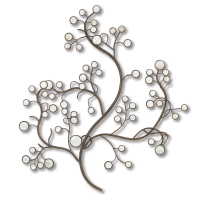 The tree branches finished in an aged bronze are covered with the multiple circles of capiz shells in varying sizes make this piece truly one of a kind. Perfect for any wall in your home. Hooks on back for easy hanging. 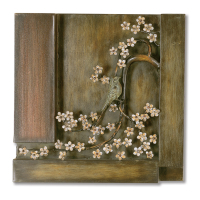 Aged bronze finished metal wall art. Use horizontal or vertical. Makes a dramatic wall statement. Hooks on back for hanging. Made in China. 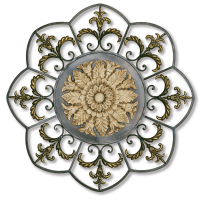 Classic Leaf and Fleur design in a distressed antique gold finish surrounds a medallion of faux antiqued ivory. Metal construction. Hooks on back for easy hanging. 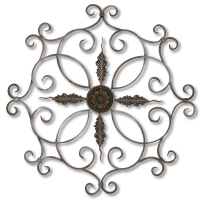 Stylized Fleur De Lis in antique gold with quatrefoil flower in center. Trimmed in Verde with blackened silver and burgundy. Hook on back for easy hanging. Made in China. Gun Metal Silver wall mount magazine holder features metal tape measure as its frame. 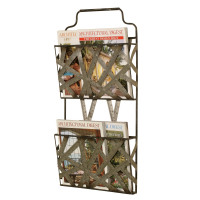 Two baskets hold all your magazines, books, etc.Two hooks on back for easy hanging. Made in China. Extendable gun metal silver wall mount coat rack features stainless steel ruler as its frame, with 16 oil rubbed bronze hooks. Extends as narrow or as wide as you need. Hooks on back for easy hanging. Made in China. Extend to max 32″ for best stability. 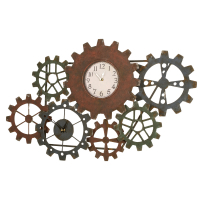 Interlocking cogs in rust, green and black are the feature of this unique wall clock. Two hooks on back for easy hanging. Battery not included. Made in China. 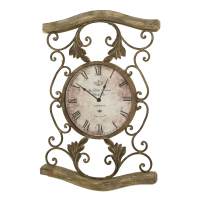 Scrolled oil rubbed bronze metal driftwood wall clock. Clock has black roman numerals, and this clock has hooks on back for easy hanging. Batteries not included. Made in China. 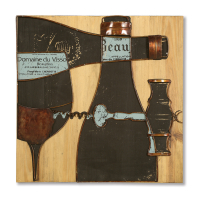 Wood wine wall art displays metal bottles, glasses and wine opener on a natural wood background. 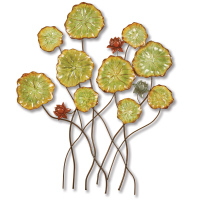 This wall art is 3 D. Hooks on back for easy hanging. Made in China. 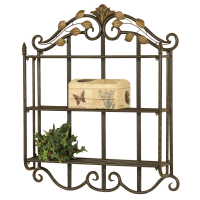 Classic wall shelf adds storage and display to any wall with its antique appearance adding rustic traditional style to any room. 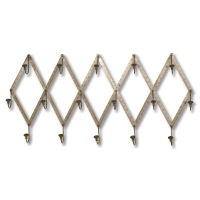 Metal display shelf with 5 hooks for hats or coats in an antiqued bronzed finish-includes shelf for storage or display and hooks on back for easy hanging. 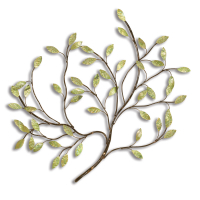 Leaves and branches finished in a dark bronze with gold highlights. Branches are layered for a 3D effect. Hook on back for easy hanging. Made in China. 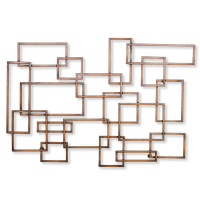 Geometric metal wall art in burnished copper finish. 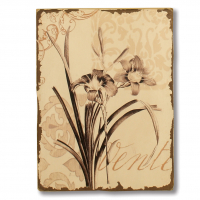 Layered metal gives a 3D effect Perfect to add visual interest to any room. Open back allows your wall color to come through for added depth. Rectangle and square shapes of different sizes come together to form this piece of beauty. Hooks on back for easy hanging. 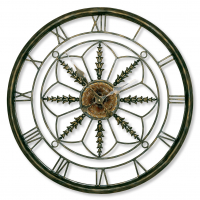 Aged bronze metal finish circular wall clock feature roman numeral numbers. Uses (1) AA battery. Battery not included. 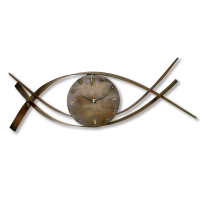 Wavy wall clock in aged brown finish with hooks for easy hanging. Takes (1) AA Battery. Batteries not included. 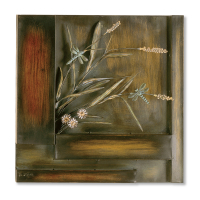 Soft industrial nautical blues, browns and distressed silvers adorn this unique metal wall art. 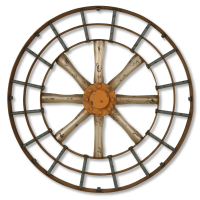 Spokes are actually “industrial painted screws”. Weathered look frame. Hooks on back for easy hanging. Made in China. 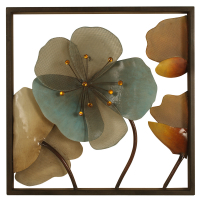 Oil rubbed bronze metal frame holds green and gold crushed stones . 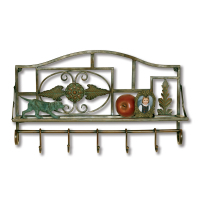 The unique shape of the metal frame gives a school of fish design. Hooks on back for easy hanging. Made in China. 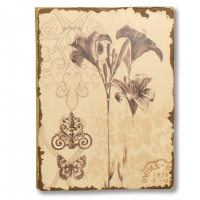 Pencil tip wall art features distressed oil rubbed bronze frame. Frame holds colorful pencils of varying lengths with all tips meeting in the center. Red, green blues and cream are the primary colors here. 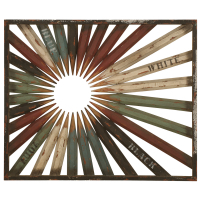 This colorful piece of wall art will brighten up any room and become a conversation piece. Wonderful in a child's room. Two sets of hooks on back allow you to hang it horizontal or vertical. Dust with a dry cloth. Made in China. 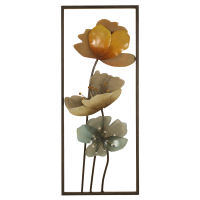 Oil rubbed bronze metal frame holds soft cream, blue and gold metal and mesh flowers. Flowers “pop” out of frame to give a 3-D effect. Hooks on back for easy hanging. Made in China. 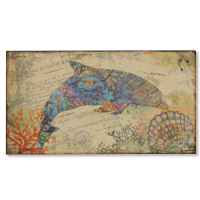 Nautical wall art features a bottle nose dolphin. Coral, blue and cream complete the beachy feel. Hooks on back for easy hanging. Made in China. 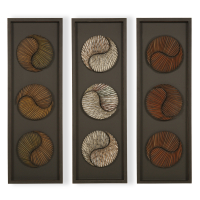 Set of 3 nautical shadow box wall art features nautilus design made from bamboo wood. 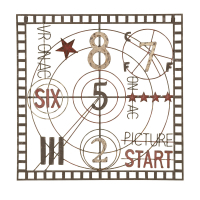 Design is elevated off the frame to give a 3-D effect. One panel is brown and black, next panel is black and soft gold and the third panel is black and cream. Use alone or as a group. Two hooks on back for easy hanging. Made in China. 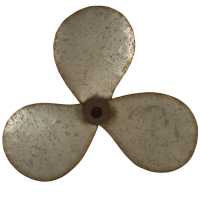 Simple yet unique weathered silver 3 spoke propeller wall art. Fabulous for a young child's room. Hooks on back for easy hanging. Made in China. 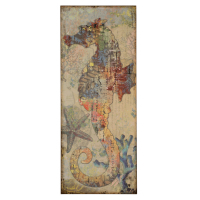 Nautical wall art features a Seahorse. Coral, blue and cream complete the beachy feel. Hooks on back for easy hanging. Made in China. 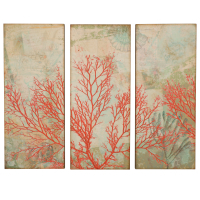 This set of 3 panel nautical wall art features cream and coral color with aqua blue. Use alone or in grouping. Makes a perfect headboard. Hooks on back for easy hanging. Made in China. Set of 2 open metal work fish wall art. 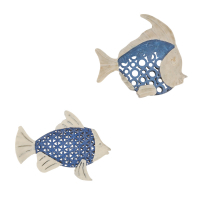 Both fish are finished in a distressed blue and weathered white. Use alone or as a group. Hooks on back for easy hanging. Made in China.